Here's a beautiful & rare 1970s JOR-EL POCKET HEROES Figure by Mego. Card shows bent edges but figure has never been removed and card is bright & clean. This is from the 1978 Superman film so Mego decided to put a Marlon Brando head on a Silver Age Jor-El costumed body. Go figure! 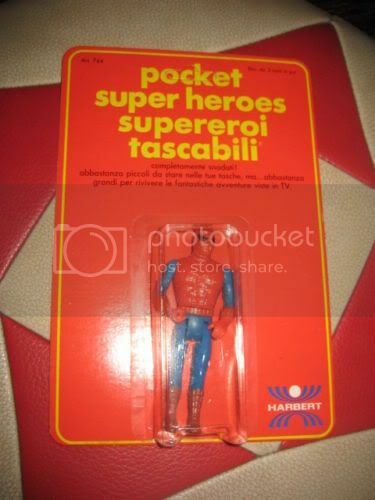 This auction features the Mego Pocket Super Heroes Spiderman mint on a near mint factory sealed card. The card is in excellent shape with a very minor vein above the punch. The bubble is near mint shape with no dents, sealed strong and is clear. Great piece for your Mego collections! Buyer to pay shipping. 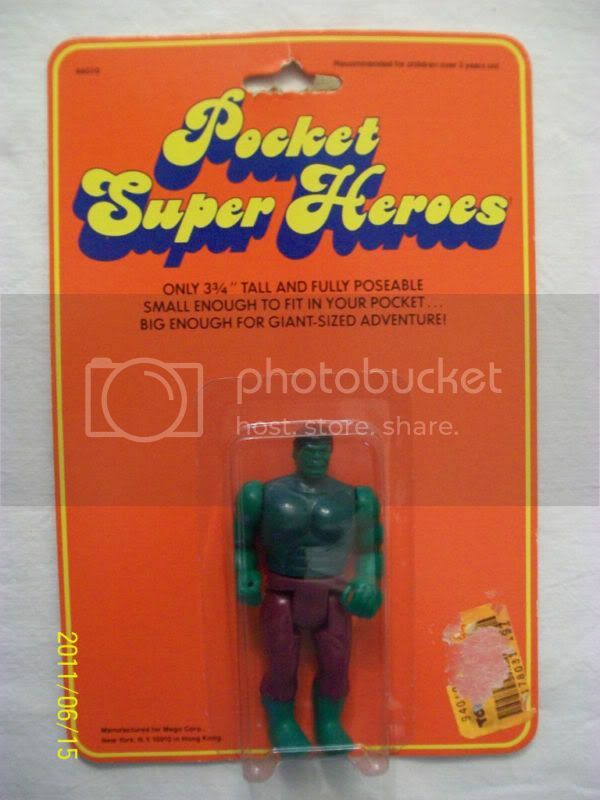 This sale is for a vintage (1979), 'POCKET SUPER HEROES' 3.75" and fully poseable action figure', featuring: 'THE HULK', by MEGO. Overall condition of this 32 year old item is 'EXCELLENT', this card lays flat, no creases, the bubble is firmly attached to the card and the bubble has no dings (see pictures). Please review all pictures and if you have any questions or would like more pictures, please email. I will send this item by the USPS first class. If you would like insurance, please let me know. Please see other items of interest in my store, and remember...I combine shipping to save you money. Thank you for shopping: THE ELECTRIC FLEA!!! 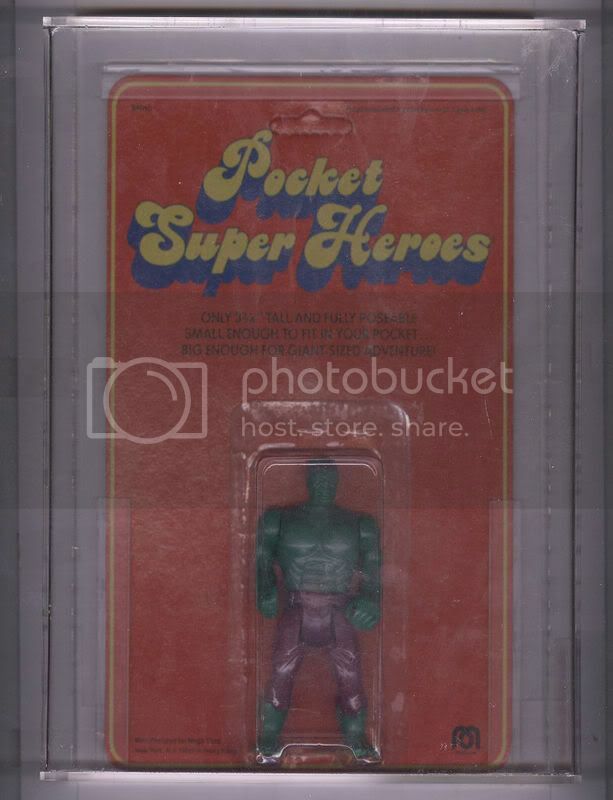 INCREDIBLE HULK 1979 MEGO POCKET SUPER HEROES AFA GRADED 80 NEAR MINT NM FIGURE. ONE OF THE HIGHEST GRADES ON EBAY. THIS FIGURE IS SUPER RARE. 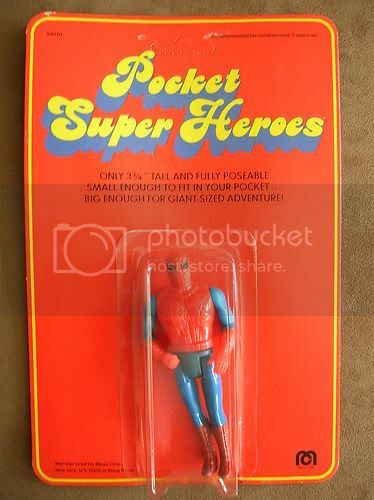 FOR AUCTION: 1979 MEGO POCKET SUPER HEROES SPIDERMAN MINT ON CARD. ITEM IS MINT NEVER REMOVED/FACTORY SEALED ON CARD. BLISTER IS CLEAR WITH NO DAMAGE. CARD IS UNPUNCHED WITH TWO SMALL MARKS IN THE RED COLOR AT THE TOP ON EITHER SIDE OF THE PEG CHAD. COLORS ARE NICE AND BRIGHT. CARD IS WARPED AND THE TOP OF THE BLISTER HAS STARTED TO SEPERATE AS A RESULT. THE BLISTER IS FULLY SEALED TO THE CARD HOWEVER AS THE TOP EDGE HAS BEGUN TO PULL AWAY A THIN WHITE EDGE IS VISIBLE WHEN TIPPED FORWARD. PLEASE VIEW PHOTO AND ASK ALL QUESTIONS PRIOR TO PURCHASE OR BID AS SALE IS FINAL. 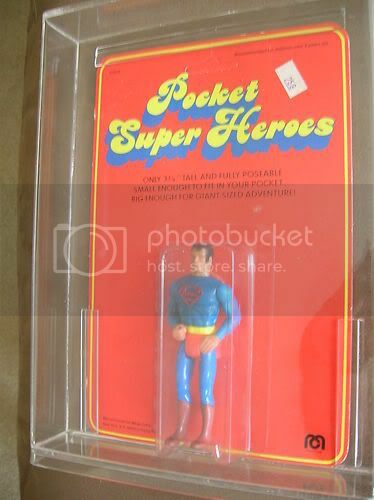 FOR AUCTION: 1979 MEGO POCKET SUPER HEROES SUPERMAN MINT ON CARD WITH FREE ACRYLIC CASE FOR DISPLAY. FIGURE IS IN MINT CONDITION, FACTORY SEALED TO CARD. SUPERMAN HAS VERY BRIGHT VIVID COLORS. BLISTER IS CLEAR WITH NO DAMAGE AND IS WELL SEALED ALL AROUND. THE CARD HAS RICH VIVID COLORS AND UNPUNCHED. THE CARD HAS MILD EDGE WEAR AND SURFACE CREASES AT 45 DEGREE ANGLES AT BOTH TOP CORNERS. THESE ARE VERY MILD AND ARE IN THE SURFACE LITHO AND NOT VISIBLE FROM THE BACK OF THE CARD. THERE IS A $2.59 PRICE TAG AT TOP RIGHT. SUPERMAN COMES SHIPPED IN A FREE ACRYLIC DISPLAY CASE ($20 VALUE). PLEASE VIEW PHOTOS AND ASK ALL QUESTIONS PRIOR TO BIDDING OR PURCHASING. SALE IS FINAL. THE HULK IS SOLD IN A SEPERATE AUCTION. THIS AUCTION IS FOR SUPERMAN ONLY. THANKS. 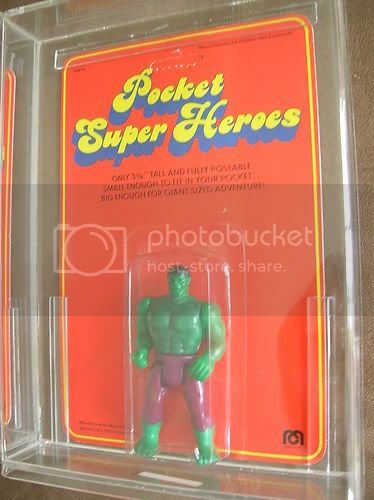 FOR AUCTION: MEGO POCKET SUPER HEROES INCREDIBLE HULK 1979 RED CARD. FIGURE IS IN MINT CONDITION FACTORY SEALED TO CARD. HE HAS SOME DEBRIS IN THE BLISTER WITH HIM JUST ABOVE HIS HEAD TO THE RIGHT. I DON'T KNOW WHAT IT IS OR HOW IT GOT IN THERE. IT IS, HOWEVER, NOT DISTRACTING. THE BLISTER IS CLEAR AND WELL SEALED WITH NO DENTS OR DAMAGE. THE CARD IS BRIGHT AND COLORFULL BOTH FRONT AND BACK. THERE IS VERY MINOR EDGE WEAR AND SLIGHT CREASING TO THE PEG CHAD. THERE IS MILD WARPING BUT LAYS NEARLY FLAT INSIDE THE AFA STYLE ACRYLIC CASE INCLUDED FREE. THIS AUCTION INCLUDES THE INCREDIBLE HULK AND THE ACRYLIC DISPLAY CASE ONLY. SUPERMAN IS IN A SEPERATE AUCTION. PLEASE ASK QUESTIONS PRIOR TO BIDDING OR PURCHASING. SALE IS FINAL. THANKS. Up for sale is a 1981 Mego Pocket Super Heroes Batmobile mint/never removed from box. 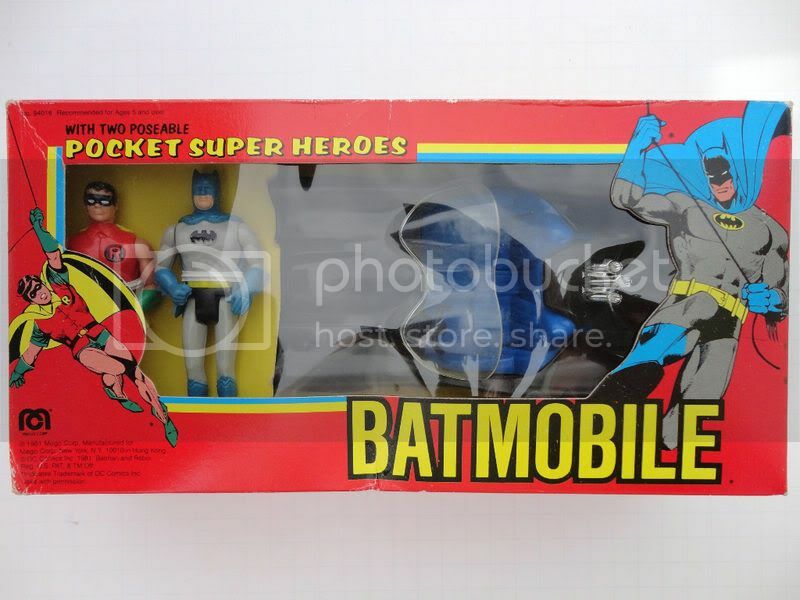 This is a very tough Mego Pocket Super Heroes Batmobile with poseable Batman and Robin. The contents have never been played with and appear to have never been removed from the box. The figures are still twist tied to the insert. The box has several spots of mild shelf wear. I have included several pics of all sides for you to examine for yourself. The cello window is free of tears and is still perfectly attached to the box. Of course this is a subjective thing, so if you have specific questions, please ask. Despite the shelf wear, this is still a good overall example of a very rare and desirable Mego piece. Last edited by vintage spideyfan; Oct 14, '11 at 10:45 PM.